Written consent was obtained from the patient to report and publish the clinical data and photographs taken of the keloid lesions. Keloid Surgery followed by Adjuvant Radiation Therapy (S-ART) is thought to result in superior outcomes and lower keloid recurrence rates. Although radiation therapy has been incorporated in post-operative management of keloid lesions for over 100 years, the actual long-term safety and efficacy of this intervention remains unknown and under-reported. The author is reporting the case of an African American female who underwent S-ART for treatment of a left earlobe keloid. She remained asymptomatic for nearly 13 years before a recurrent keloid was noted at the site of the prior surgery. Despite several subsequent surgeries and a repeat course of radiation therapy, the recurrent lesion transformed into a massive keloid, impacting her daily life. To the author’s knowledge, such a delayed recurrence of keloid lesion after S-ART has not been previously reported. This case is an alarming example of many keloid patients who go through the same exact treatment pathways, undergo repeated surgeries and end up with a similar or even worse outcomes. 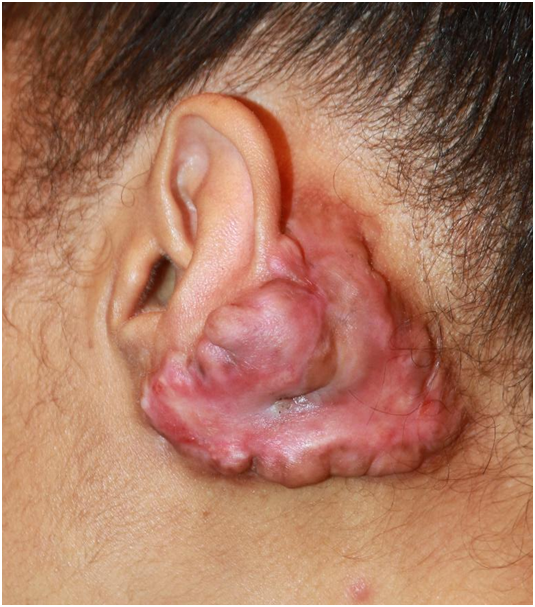 A 40-year-old African American female, born in 1976, presented to the author in September 2016 with a massive left ear keloid (Figure 1). She had her ears pierced twice, first at age of ten and then again when she was thirteen. A small keloid formed on the posterior aspect of her left earlobe soon after her second piercing. At that time, this keloid was treated with intra-lesional steroid injections, but it failed to respond to this intervention. In 1991, she underwent an excision of this keloid lesion but soon after surgery, the keloid regrew and failed to respond to post-operative steroid injections or pressure earring. Second surgery was performed in 1992. Rapid recurrence was noted during her pregnancy in 1994. S-ART was performed in 1995, which resulted in a long-term disease control until 2008 when recurrent keloid was once again noted at the same site. Repeat surgeries were performed in 2008, 2010 and S-ART in 2014. Unfortunately, the keloid regrew soon after each surgery. As part of her last keloid surgery, skin was harvested from her lower abdomen to reconstruct the defect caused to her ear. Soon after this surgery, there was a recurrence of the keloid at the site of the ear surgery and reconstruction. In addition, she developed a totally new keloid on her lower abdomen, at the site of skin harvest (figure 2). 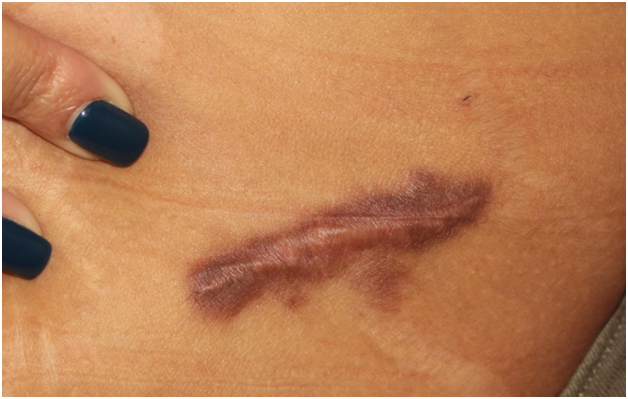 After so many failed surgeries, patient gave up hope and decided to live with her keloid. Her ear keloid continued to grow. She presented to the author in September 2016, at which point she was started on a course of treatment with cryotherapy. Figures 3 and 4 depict her progress and tremendous reduction in the mass of her keloid with contact cryotherapy alone. As of May of 2017, she remains under treatment to further improve the appearance of her ear. Figure 1. September 2016, massive left ear keloid with extension to the posterior auricular and upper posterior cervical skin at presentation. Figure 2. September 2016. Keloid formation at the site of skin graft harvest from the left lower abdomen for reconstruction of the ear defect. FIGURE 3. December 2016, after two treatments with cryotherapy. FIGURE 4. May 2017, after three treatments with cryotherapy. Although the concept of S-ART dates back to 1905, it is now advocated as the most effective treatment for keloid lesions. The procedure is even promoted in late-night television advertisements by some plastic surgeons. This costly and rather high-risk approach, however, may not be as effective as it has been hoped for, and can indeed result in very poor outcome as demonstrated in this case report. Furthermore, it is also critical to report the risk of massive and semi-massive keloids that develop after S-ART. In a recent publication of 283 patients with ear keloids, the author reported 11% incidence of massive and semi-massive keloids, with many of these patients having undergone S-ART. In another report by the author, 31 cases of massive and very large keloids were seen among 82 patients with neck keloids. 28 out of these 31 patients had previously undergone keloid removal surgery. Keloid removal surgery was found to be the most important risk factor for development of recurrent, very large and massive ear and neck keloids. Lastly, the long-term carcinogenic risk of radiation is real yet unmeasured in S-ART treated keloid patients. In his recent publication, Kim concludes that “the safety and effectiveness of postoperative radiation therapy after keloidectomy should be assessed in a study with a larger number of cases,” and Shen concludes that S-ART to be effective yet “relatively safe”. Although radiation therapy proved to be an effective treatment for benign skin diseases in 1940s to 1960s, it was later found to cause excess rate of cancer, and therefore its use was abandoned. 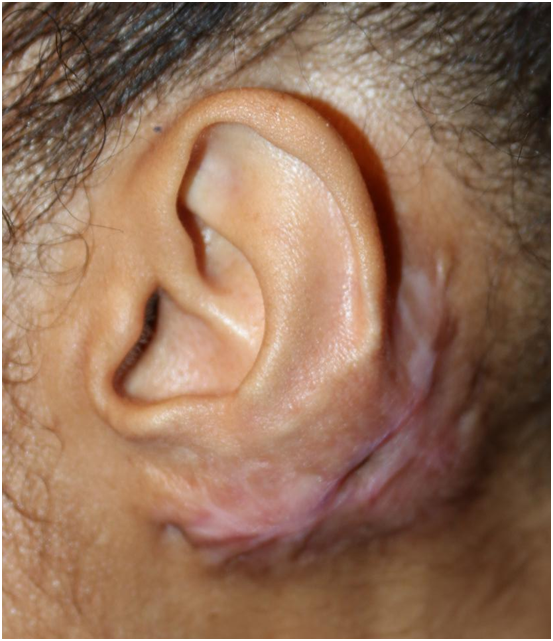 Author recommends non-surgical approach for treatment of all keloid lesions and contact-cryotherapy for upfront treatment of all bulky ear keloid lesions. In the author’s opinion, keloid disorder, which is a genetic wound-healing ailment, cannot be treated with methods that induce a new injury to the skin and trigger the same pathological wound-healing reactions. We cannot start down the path of treating keloid patients with surgery, and then try to fix the issues that are caused by surgery, i.e. recurrence and worsening of the keloid lesions, by utilizing radiation therapy. This approach obviously leads to formation of massive keloids in certain percentage of patients. A non-surgical primary approach utilizing contact-cryotherapy will, in fact, prevent development of the type of complications that were even reported 100 years ago by utilizing surgery and radiation therapy. Author has obtained a written consent from the patient to publish this case report and to make her medical records available, if requested by the editor in chief of the Journal. The author declares that no grants were involved in supporting this work. Porter CA. Massive keloid of face and hands. Ann Surg. 1909 Jul. Shen J, Lian X, Sun Y, Wang X, et. al. Hypofractionated electron-beam radiation therapy for keloids: retrospective study of 568 cases with 834 lesions. J Radiat Res. 2015 Sep;56 :811-7. Van Leeuwen MC, Stokmans SC, Bulstra AE, et al. Surgical excision with adjuvant irradiation for treatment of keloid scars: a systematic review. Plast Reconstr Surg Glob Open. 2015 Aug 10; 3:e440. Kim K, Son D, Kim J. Radiation therapy following total keloidectomy: a retrospective study over 11 years. Arch Plast Surg. 2015 Sep; 42:588-95. Miyahara H1, Sato T, Yoshino K. Radiation-induced cancers of the head and neck region. Acta Otolaryngol Suppl. 1998; 533:60-4. Ron E. Cancer risks from medical radiation. Health Phys. 2003 Jul;85 :47-59. Davis JS. (1919) Plastic Surgery, its principles and practice.